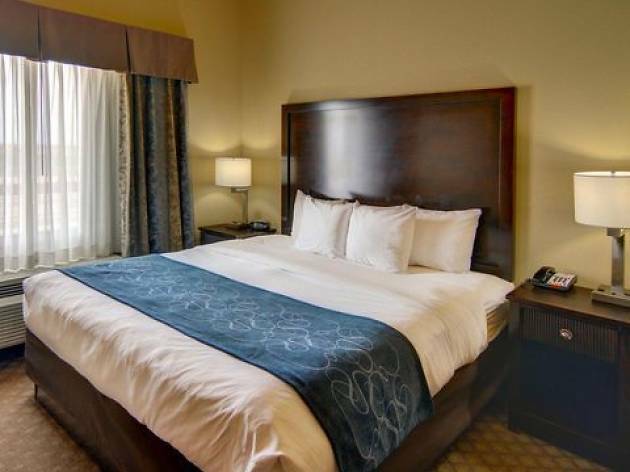 The Comfort Suites Frisco, located north of Dallas, is perfect for sports fans. 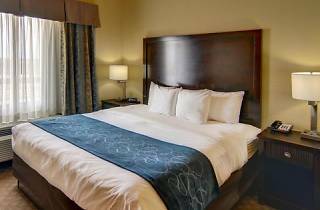 The hotel is a short distance from the Dr. Pepper Ballpark, the Ford Center at The Star (the Dallas Cowboys’ practice facility and varsity football venue) and Toyota Stadium, the home of F.C. Dallas. If you want to indulge in some shopping, Stonebriar Mall and Ikea are practically down the street. You will be spoiled for choice when it comes to bars and restaurants, with Frisco Square, The Shops at Legacy and Legacy West a stone’s throw away. The smoke-free rooms have the following amenities: flat-screen TV, a microwave, a hairdryer and ironing facilities. The hotel offers free breakfast with newspapers, a fitness center, a business center with access to computers and printers, free Wi-Fi, an indoor pool and hot tub. Transportation to the local office park is available with advance reservation.